You need the incredible G.M. 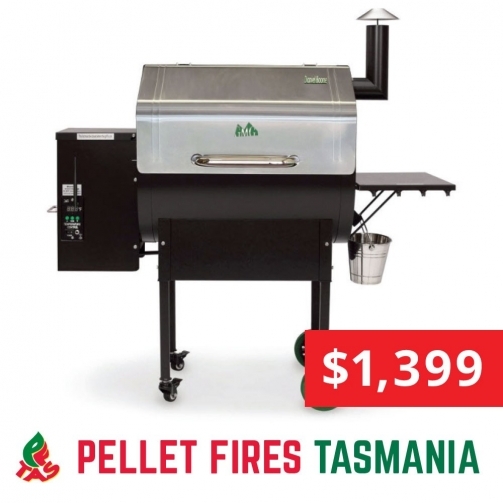 Daniel Boone Pellet Barbeque in your life, and you can have one for just $1,399 at Pellet Fires Tasmania! Connect via the free GMG App or use the remote control and programmable timer to cook your meal to perfection! With Italian electronics, automatic ignition, thermostat control, self-cleaning system and 5-year warranty, this innovate barbeque will make you the envy of family and friends! Offer applies to G.M. Daniel Boone Barbeques at Pellet Fires Tasmania only. Voucher must be presented to claim. Offer ends 5th of April 2019. Other conditions may apply. See in store for details. Pellet Fires Tasmania was established in 2001 by Rob Douglas to introduce new Pellet Heating technology to Tasmania. It became obvious that there was a large opportunity for a specialist consultative business to provide total and comprehensive solutions based on customer needs. Our showroom and head office in Moonah was opened in 2004. The product range was expanded to include all types of technologies, (heat pumps, electric, wood, gas, pellet, solar etc.). PFTAS Pty Ltd was incorporated in 2006 and continues to trade as Pellet Fires Tasmania. Warehouse facilities were added in 2012 located next door to the showroom opposite Moonah Primary school. Ulverstone was opened in 2012 and Launceston in 2014.